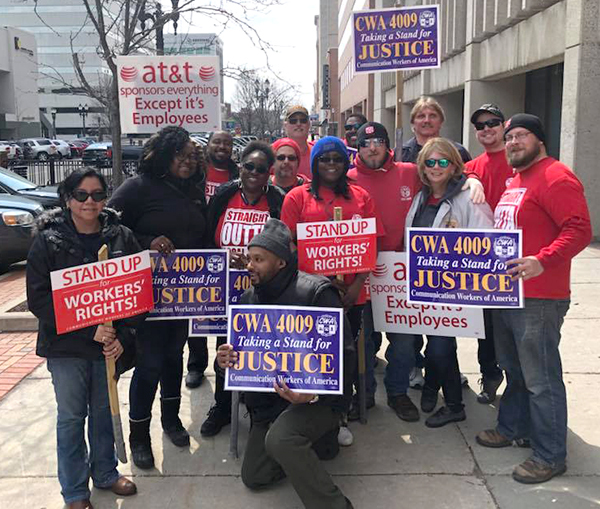 With two contracts covering nearly 14,000 workers at AT&T Midwest and AT&T Legacy T set to expire on Saturday, CWA members voted overwhelmingly this week to authorize a strike, if necessary. 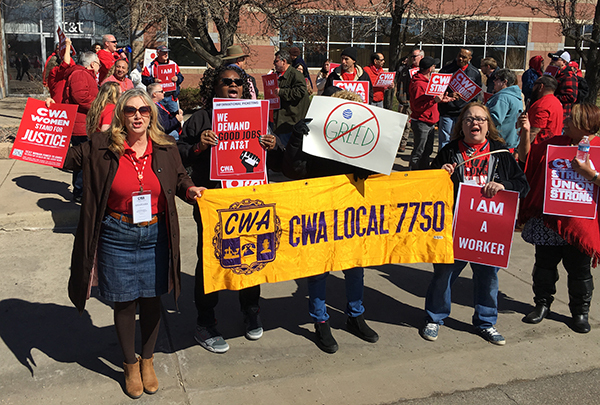 CWA District 4 Vice President Linda L. Hinton said, "CWA members are prepared to do whatever it takes to get a fair contract at AT&T Midwest that prioritizes job security, healthcare, and retirement. It is time for AT&T to live up to Randall Stephens' promises to create thousands of new jobs in the U.S. if the Republican corporate tax bill passed. AT&T's profits and tax windfalls must turn into jobs and employment security for CWA members." Vice President of Telecommunications & Technologies Lisa Bolton said, "Our members are ready to fight for a fair contract at AT&T Legacy T, even if that means going on strike. AT&T must stop farming out our work to the lowest bidder. After the tax bill passed, Stephenson promised the company would create 7,000 good, skilled, high-wage jobs. But at our bargaining tables, management demands second tier jobs with second tier wages and second tier benefits. It is time for AT&T to live up to Stephenson's promises." The AT&T Midwest contract covers workers in Ohio, Michigan, Illinois, Indiana, and Wisconsin, while the AT&T Legacy T contract covers workers nationwide. Top: CWA locals from Michigan are showing AT&T Midwest that their members are ready do whatever it takes to get a fair contract. Bottom: CWA members from Local 7750 in Denver, Colo., are mobilizing for a fair contract at AT&T Legacy T.
Citing concerns about wages, job security, health care, maternity and paternity policy, as well as a lack of development opportunities and diversity within the newsroom, staff members at the Chicago Tribune this week announced that they are working with the NewsGuild-CWA to fight for union representation. "We would love nothing more than to focus completely on doing our jobs. But we also want to ensure that our news organizations will survive and thrive so they can continue to serve our readers. We can no longer let our newsrooms be guided solely by corporate voices who don't understand journalism's crucial role or what it takes for us to fulfill the public trust we accept when we walk through the door each day," the Chicago Tribune Guild organizing committee wrote in a letter to all Chicago Tribune employees. Eleven AT&T DIRECTV administrative employees in Puerto Rico have won representation and are now a part of CWA Local 3010. The organizing effort was led by Local Organizer Cynthia Seda-Lopez, the local organizing committee, and Local President Luis M. Benitez-Burgos. The ten-member staff at the Missoula Independent, an alternative weekly newspaper in Montana, voted unanimously in favor of joining the NewsGuild-CWA on April 6. They will be represented by Pacific Northwest Newspaper Guild/CWA Local 37082. Employees at the L.A. Times won a big victory when they voted to form a union with NewsGuild-CWA at the end of January. Now, a new report compiled by the L.A. Times Guild based on data that members requested from the company during the collective bargaining process shows that L.A. Times parent company Tronc is underpaying women and journalists of color. According to an analysis of newsroom salary data, among journalists at The Times of all ages and job titles, women and people of color make less than white men. On average, women of color in the L.A. Times’ bargaining unit make less than 70 cents for every dollar earned by a white man. The analysis shows significant and persistent gaps even when comparing women and people of color to their male and white peers in the same jobs with similar experience. CWA sent a letter to all members of the House of Representatives urging them to oppose three harmful bills this week that would increase the risk of another financial crisis. H.R. 4061 would make it more difficult to classify non-bank financial institutions like AIG as "too big to fail." Those institutions are subject to increased transparency requirements, so the bill is designed to allow big corporations to dodge these requirements. H.R. 4293 would undermine the effectiveness of the Federal Reserve's stress tests and reduce their frequency, taking away tools and reducing the amount of information available to the Federal Reserve about bank health. H.R. 4790 would roll back laws that limit banks from being able to make the kind of risky speculative investments that contributed to the 2008 financial crisis. "CWA believes strongly in the need for a resilient financial system that serves the needs of working people. These bills, instead, would increase the risk of a financial crisis that would undermine the interests of our membership," the letter read. An act of defiance by Denver Post employees has thrust a powerful hedge fund's destruction of local news coverage to the front pages of publications across the country. Editorial staff of Colorado's biggest newspaper took the extraordinary step of blasting Alden Global Capital, owner of the Denver Post and 200 other newspapers, in the paper early this week. "News matters," the headline blared. 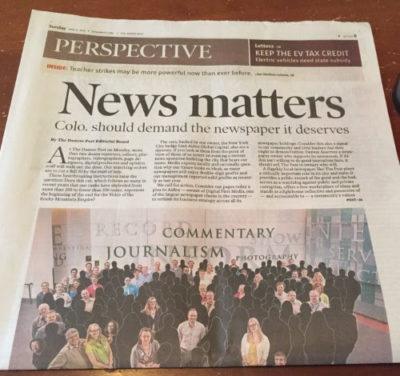 "Colo. should demand the newspaper it deserves." The editorial denounced "heartbreaking instructions" to cut already severely diminished staff with 30 more layoffs. Accompanied by multiple signed columns, the feeling of a rebellion was unmistakable. After two years of relentless reporting by Julie Reynolds and others on the Digital First Media workers website, the story of Alden's disastrous effect on the newspapers it owns or controls is finally breaking through. "Media experts locally and nationally question why our future looks so bleak, as many newspapers still enjoy double-digit profits and our management reported solid profits as recently as last year," the editorial board wrote. "Denver deserves a newspaper owner who supports its newsroom. If Alden isn't willing to do good journalism here, it should sell The Post to owners who will." Editorial staff of the Denver Post took the extraordinary step of blasting their owner Alden Global Capital in the paper this week. UPDATED: A correction to this story was made to reflect that the editorial board members who criticized the paper's corporate owner were from management -- not rank and file union members.